Official G&J Kartway Website - www.gandjkartway.com - Please Check Website for Track Schedule. Take OH - 129, exit – 24 west towards Hamilton. Turn right on US - 127, heading north. Follow US - 127 11 miles to Camden. At north end of town turn right on Anthony Wayne Parkway also called North Main St. Turn left on Barnett's Mill Road. Take US - 127, exit - 10 south. Follow US - 127 south 13 miles to Camden. Turn left on Anthony Wayne Parkway also called North Main St.
We are located after the big hill on the left, approx 3 miles. Located among the cornfields and pastures of Southwestern Ohio lies a WKA Master Track known as G & J Kartway. The track entrance is marked by the silos used by Barnets Inc. which is owned and operated by track owner Gary Gregg. G & J Kartway was built by Gary’s father, Bill, in 1958 and was used by Gary, his sister and other local karters as a fun track for several years. Initially, a 1/7 mile dirt track, it was paved in 1962 and expanded to a ¼ mile in 1966. Now in its 47th year of operation, G & J Kartway has been the home of the Ohio Valley Karting Association since 1964. In 1968, the track was expanded to its current ½ mile, 9 turn configuration. For many years the distinguishing feature of G & J was the Monza-style turn at the end of the back straight-away. This high-banked left-hand corner was removed in 1973. 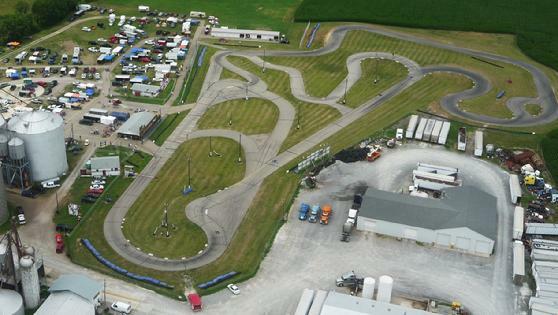 Located in rural Preble County, the track is within 60 miles of Dayton and Cincinnati and less than 2 hours from Columbus, Ohio drawing karters primarily from Ohio, Indiana and Kentucky. In addition to being home of OVKA, a 200+ member kart racing club, the track has hosted events for the World Karting Association, Great Lakes Sprint Series, former Ohio Sprint Series and SKUSA, in addition to numerous driving schools and non-karting events. The WKA Gold Cup held in July of 2004 saw in excess of 400 participants, one of the largest summer national events for this series and the largest G & J has hosted. G & J Kartway has had a rich history of participation in the preparation of many nationally known drivers. Tom Cruise participated in a driving school at G & J Kartway in preparation for his role as Cole Trickle in Days of Thunder. Professional drivers who have raced at G & J include Lake Speed, Tony Stewart, Scott Goodyear, Ernie Irvin, Sara Fisher and Sam Hornish to name a few. In addition to hosting many races this season, G & J Kartway is open for practice throughout the year, weather permitting. The practice fee is $10.00 for unlimited track time, one of the best values in karting. So, if you’re in Southwest Ohio and looking for a great track, make your way to Camden, Ohio and look for the silos…there is a true gem of a track waiting for you. Directions and schedules can be found at ovka.com and at gandjkartway.com.